Stay on top of your inventory. You may have heard me say before, “shop your pantry before you shop the store.” Always staying aware of what you have on hand and using those ingredients first helps keep your “inventory” low and reduces the need for storage space (in addition to the obvious benefits of keeping your grocery costs low and reducing waste). Take regular inventory of your ingredients, cook from what you have on hand as much as possible, and buy only what you need and when you need it. 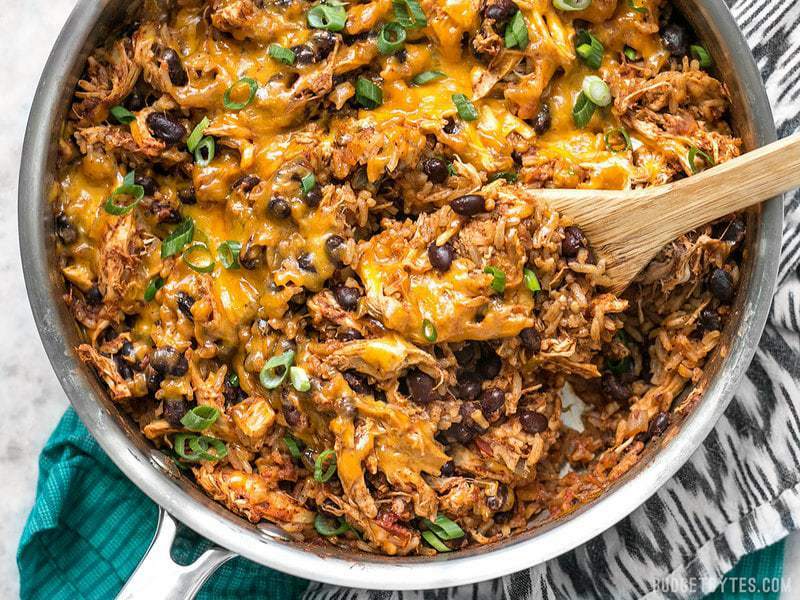 Cook one-pot, sheet pan, or skillet meals. 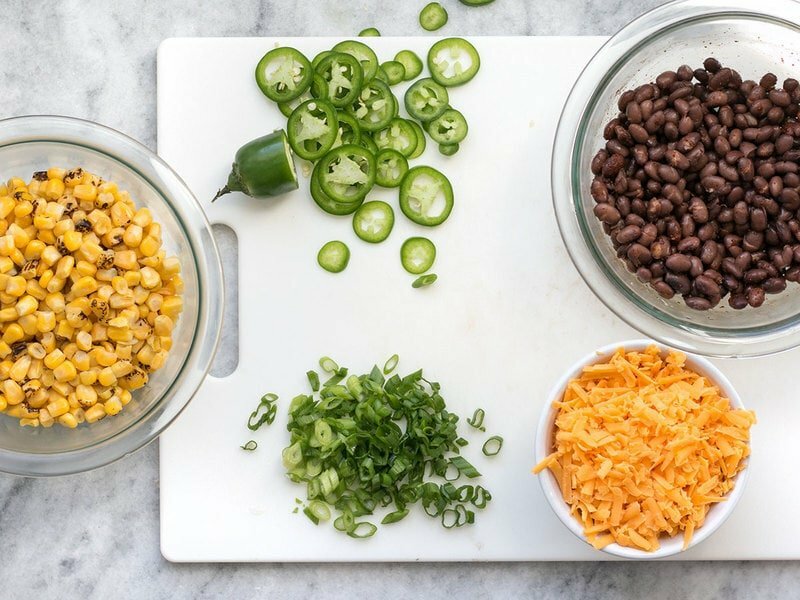 These simple all-in-one style recipes will cut down on the number of dishes you have to clean and the amount of activity you have going on in the kitchen while you cook. Keeping it simple is key in a small space. 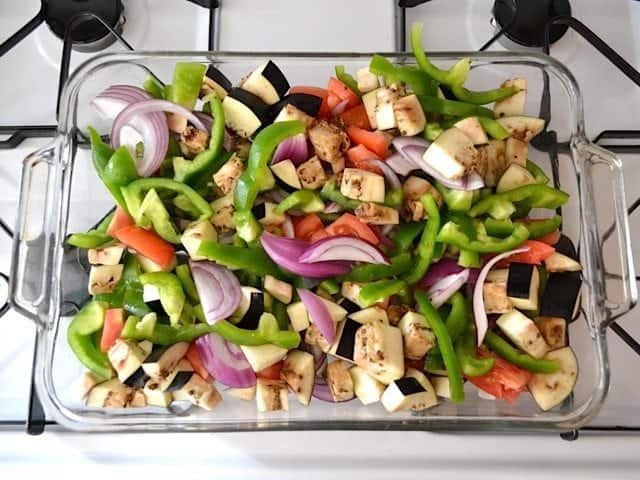 Check out my One Pot Meal recipe category for ideas. Make a game plan for cooking. Before you begin cooking, run through the directions for your recipe(s) in your head to make sure you won’t need your limited workspace for two things at one time. If you have a sheet pan coming out of the oven, you need a place to put it as it cools. If you’re draining pasta in a colander in the sink, make sure you’ll have space in the sink available. You don’t want to be dancing around your kitchen with a hot pot in hand and no where to set it down! Limit your tools, equipment, and appliances. I’m a huge advocate for keeping it simple in the kitchen, using only very basic kitchen tools, and focusing on multipurpose kitchen equipment. A basic chef’s knife can accomplish hundreds of tasks, while a banana slicer can only do one. A Dutch oven can act as both a soup pot and a roasting pan. A simple cheese grater can shred not only cheese, but a variety of vegetables, frozen butter (for making pastry), or even quickly remove the zest from citrus. Stay away from single use tools and go for the tried and true classic kitchen tools. Here is a list of the basic kitchen equipment that I find most valuable. Mise en place (prep first). 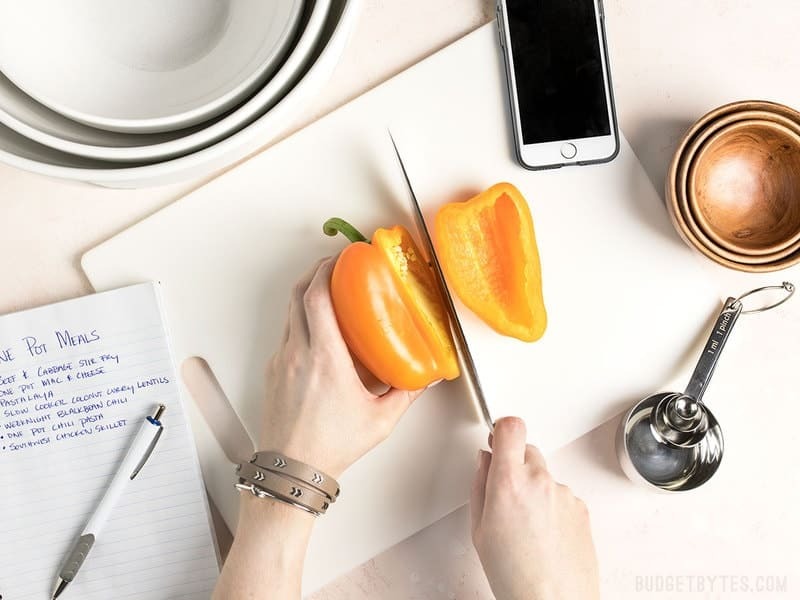 Since you’ll likely be using your workspace for multiple purposes throughout the cooking process, it can help to do all your chopping, measuring, and prepping before you actually begin cooking. This way you can go as slow as needed and use your one work space for one task at a time, instead of frantically trying to multitask while the heat is on. Clean as you go. Dishes can pile up fast as you cook and quickly encroach on the prep area in your tiny kitchen. Take every spare minute you have to clean a dish or utensil, or put away an ingredient. Instead of watching the pot as you wait for it to boil, clear away a few items. Have something baking in the oven? Put away everything that has already been used. As an added bonus, cleanup after cooking is so much less daunting if half of it has been already been done in small increments along the way. You may have to build this habit over time, but it’s SO worth the effort. Invest in nesting bowls, pots and pans, and containers. Say goodbye to the chaos of random containers in your cabinet whose lids have long been lost. Invest in nesting items so components don’t get lost, you save cabinet space, and your kitchen appears clean and decluttered. Yes, they even make pots and pans specifically designed to nest now! Yay! Transform your sink or stove top into a prep surface. This was probably my most common technique when I had a tiny kitchen and limited counter space. Place a large cutting board over your burners or straddling your sink and use it as a prep surface. Just be extra careful that the board is sitting even and is stable. There are even cutting boards specifically designed to straddle the sink or cover the burners on your stove top. Try a mobile kitchen cart. Another great way to get extra prep space is to use a kitchen cart. You can wheel that mobile prep surface in and out of the kitchen as needed and most have lower shelves for extra storage, or even hooks on the side for hanging utensils. Some are even collapsable! Utilize wall space and the inside of cabinet doors. Got empty walls? Line up removable hooks on your walls to hang lightweight objects like cooking utensils, measuring cups and spoons, kitchen towels, etc. If you’re handy, install stronger hooks with drywall anchors to hang heavy items like pots and pans. This Buzzfeed article is probably the best round up of ways to add storage in a small space that I’ve ever seen, so check it out for clever ways to add storage to the inside of cabinets and empty wall space. The post Tips for Cooking in a Tiny Kitchen appeared first on Budget Bytes.